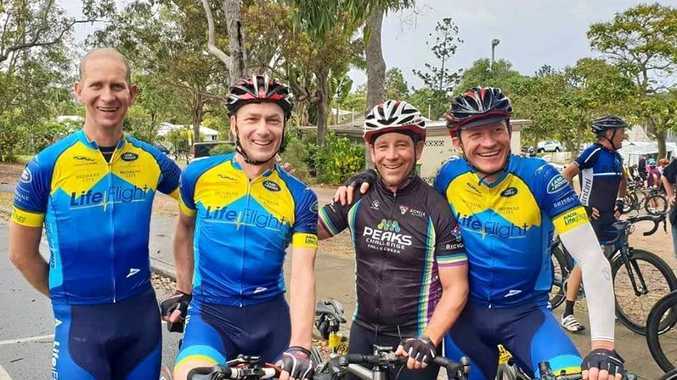 BIG RIDE: Brenton Thompson (second, from left) is preparing to face the Everesting Challenge next month with (from left) Matthew Locker, Steve Randall and Frederik Vekeman. IT'S a challenge known to bring grown men to tears. But this knowledge hasn't deterred Toowoomba cyclist Brenton Thompson. Mr Thompson will take part in the Everesting Ride next month, an activity which requires cyclists to ascend and descend a hill multiple times, cumulatively climbing the same elevation as Mt Everest - a cool 8848 metres. He will attempt the feat on Hunchy Road in Montville, a 5.6km hill set at a 7.5 per cent gradient. Three other cyclists will complete challenge with him. "I have mixed emotions about the upcoming ride," Mr Thompson said. "I'm excited by the prospects, but overwhelmed by the sheer magnitude. "I've heard the more you ride the more the pain compounds, and I've never tackled something like this." Mr Thompson turned to cycling seven years ago after a knee injury. He has now completed several long course rides, but considers this his biggest challenge yet. The riders will donate all funds raised from the event to RACQ LifeFlight. Mr Thompson has raised more than $3000 so far. "A lot of people have been supported by them and this is just a way to give back." Mr Thompson will begin his ride at 4am on November 10, and hopes to cross the finish line before midnight. If he completes the ride, he will be inducted into the Everesting Hall of Fame. More information can be found on the RACQ LifeFlight Cycling Challenge Facebook page, donations can be made here. The Summit of Everest: What it's Like: Discover exactly what life is like on top of the world.